NOTE: parenthesis indicate a edited out section. 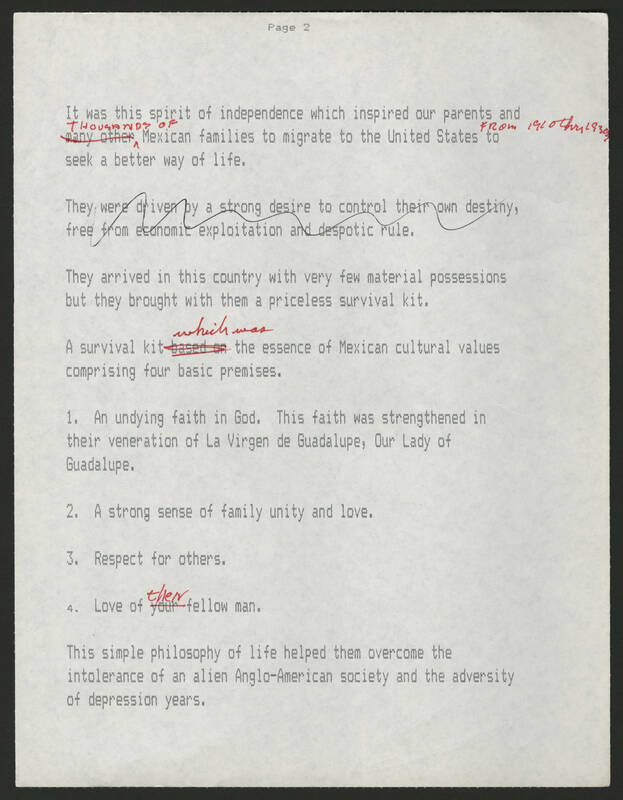 Page 2 It was the spirit of independence which inspired our parents and (many other) thousands of Mexican families to migrate to the united states from 1910 to 1935 to seek a better way of life. (They were driven by a strong desire to control their own destiny, free from economic exploitation and despotic rule.) They arrived in the country with very few material possessions but they brought with them a priceless survival kit. A survival kit (based on) which was the essence of Mexican cultural values comprising four basic premises. 1. An undying faith in God. This faith was strengthened in their veneration of La Virgen de Guadalupe, Our Lady of Guadalupe. 2. A strong sense of family unity and love. 3. Respect for others 4. Love for (your) their fellow man. This simple philosophy of life helped them overcome the intolerance of an alien Anglo-American society and adversity of depression years.